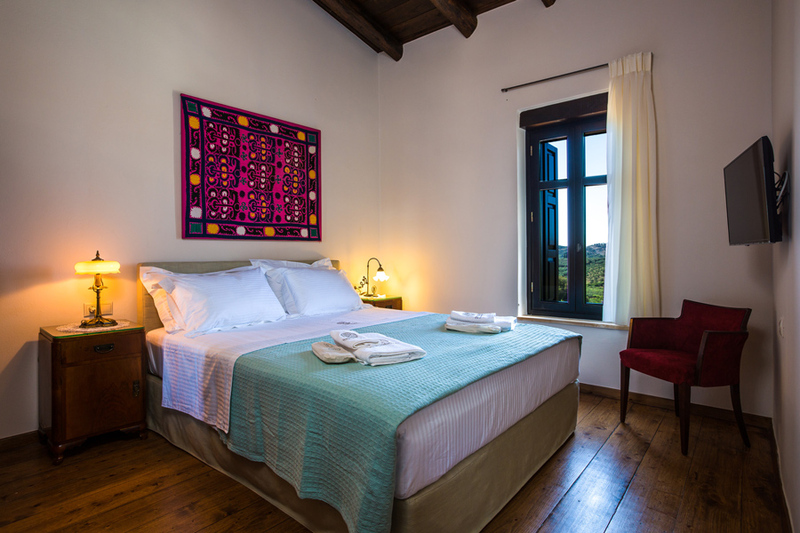 Erondas Villas - Immerse yourself in the Cretan countryside! 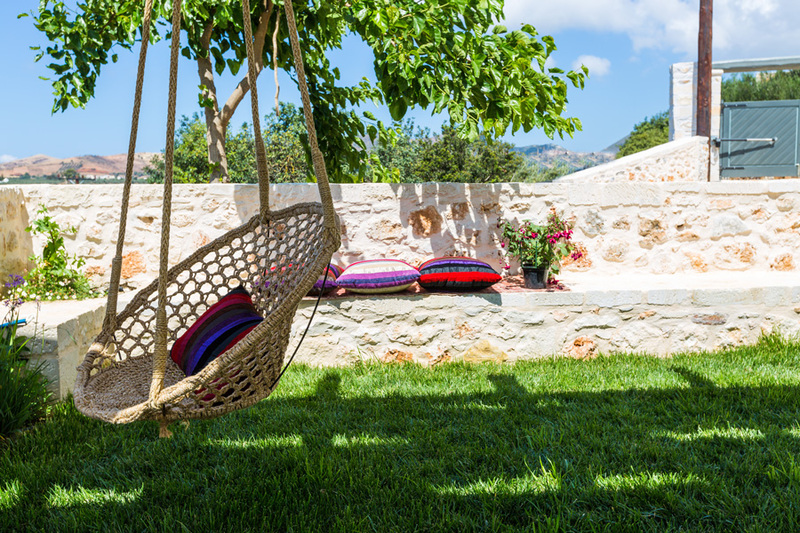 Immerse yourself in the Cretan countryside! 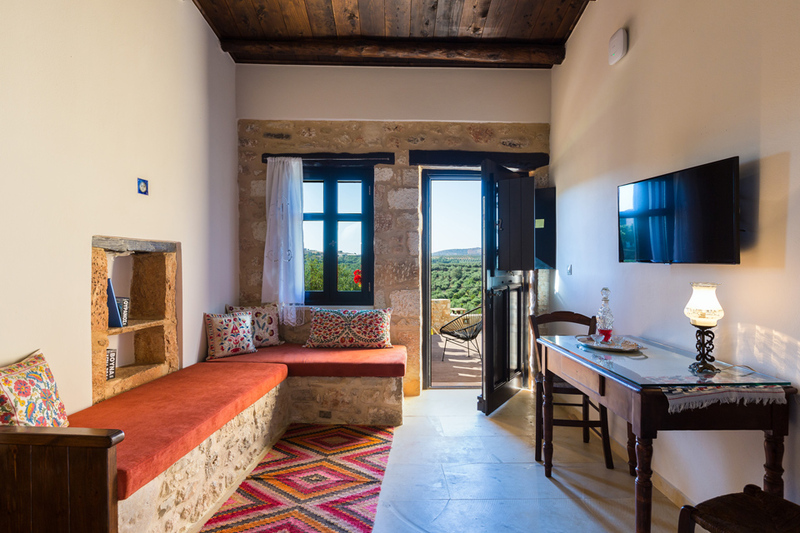 Welcome to Erondas Villas, built on the hillside of the picturesque village of Achlades, offering magnificent views to the surrounding olive groves, along with the so coveted peace and quiet everybody needs while on holiday. 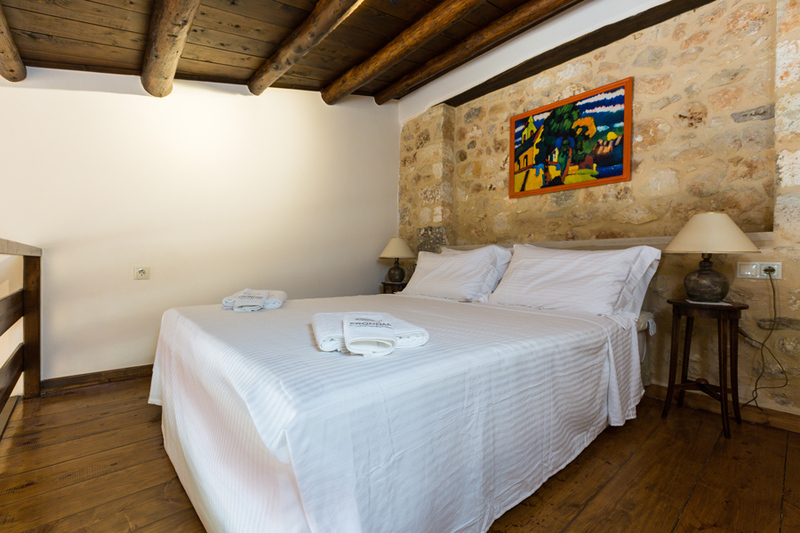 Erondas is an alternative designation for the therapeutical herb, dittany, but in the cretan dialect also means love. 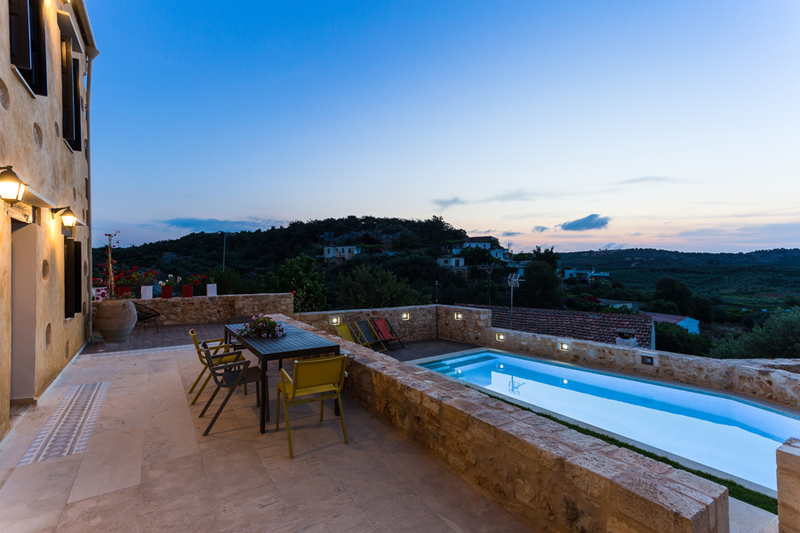 Erondas Villa I covers 200 m2 in its 3 levels and can accommodate up to 8 (+2) guests in its 4 bedrooms. 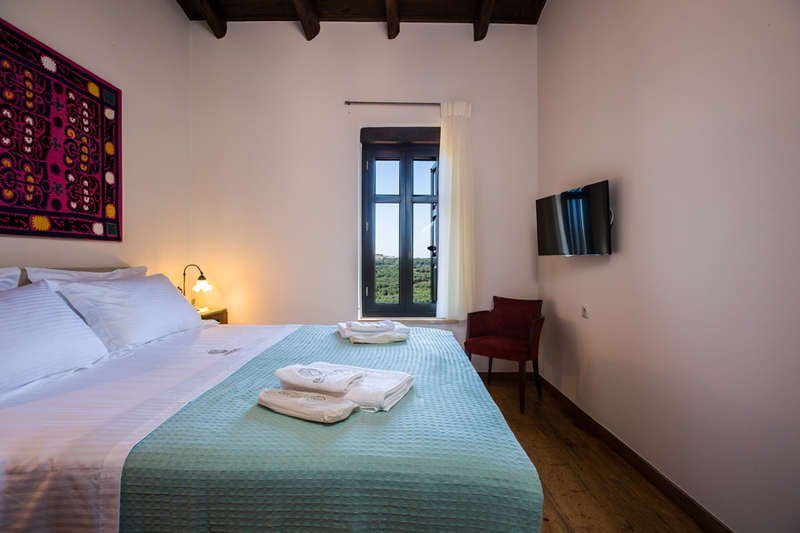 Two more guests could be accommodated in folding beds, making this villa big enough for large families or groups of friends. 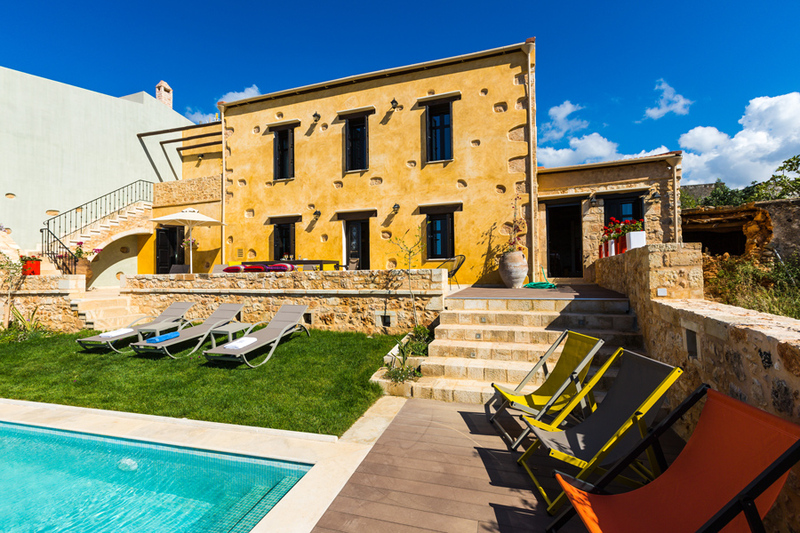 The villa is actually a traditional residence of the mid 19th century, in complete harmony with the environment, thanks to the careful restoration which recently took place and gracefully turned it in a luxurious, fully equipped villa, unique for long breaks in the beautiful island of Crete. 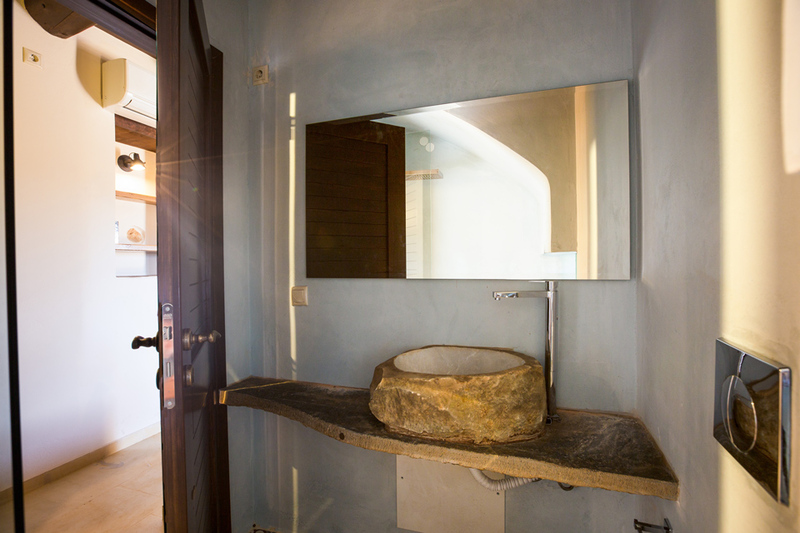 The local materials that were used for the remodelling of Erondas Villa I, include untreated stones, tiles of the interwar era, cypress trunks and handmade bricks and an old trough, adhering to the traditional architecture and respecting the residence’s history. 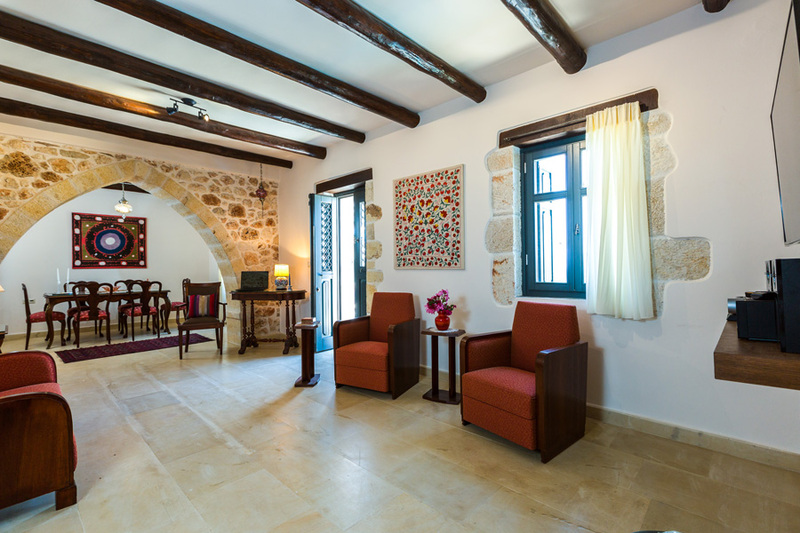 The traditional elements and its authentic character were preserved and highlighted throughout the villa: some exquisite pieces of furniture carefully restored, wall arches, wooden floors and ceilings, creating unique ambient spaces of high aesthetics. 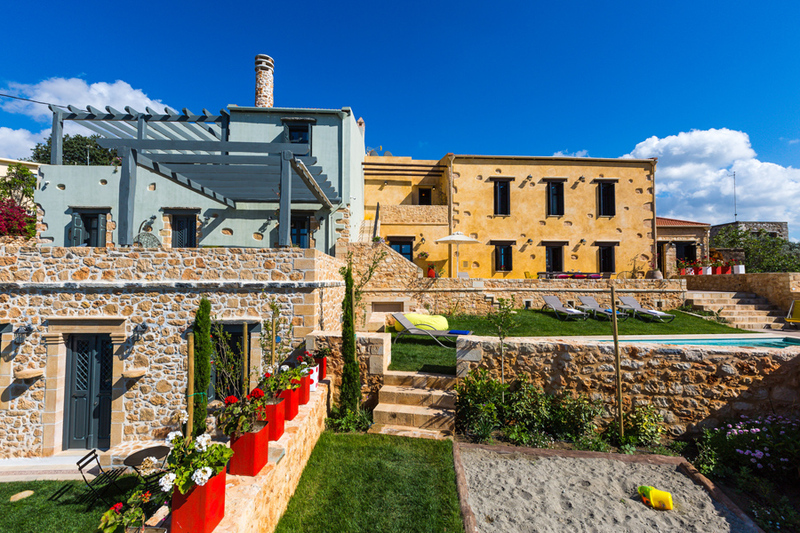 Villa I is approved by Greek Tourism Organization with license number 1041K91003162101 & 1041K91003193801. 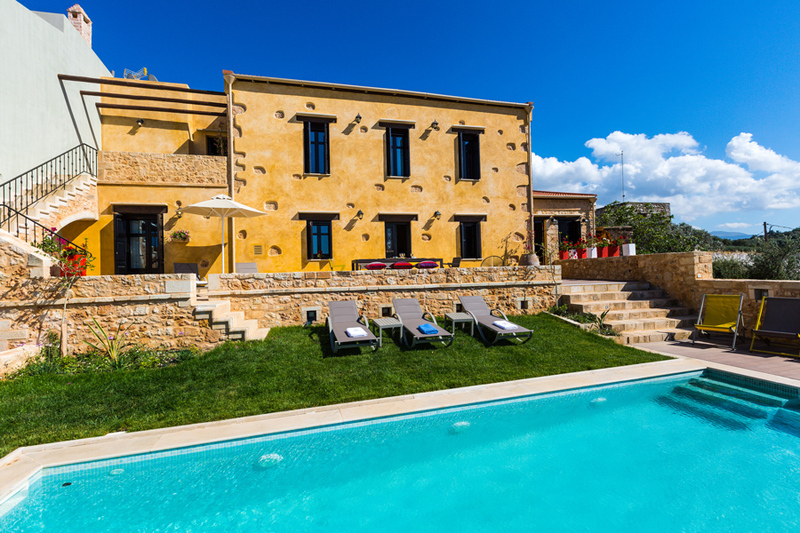 Unwind by the 40 m2 private pool (0,90 cm to 1,50 m deep) and enjoy the hot summer sun! 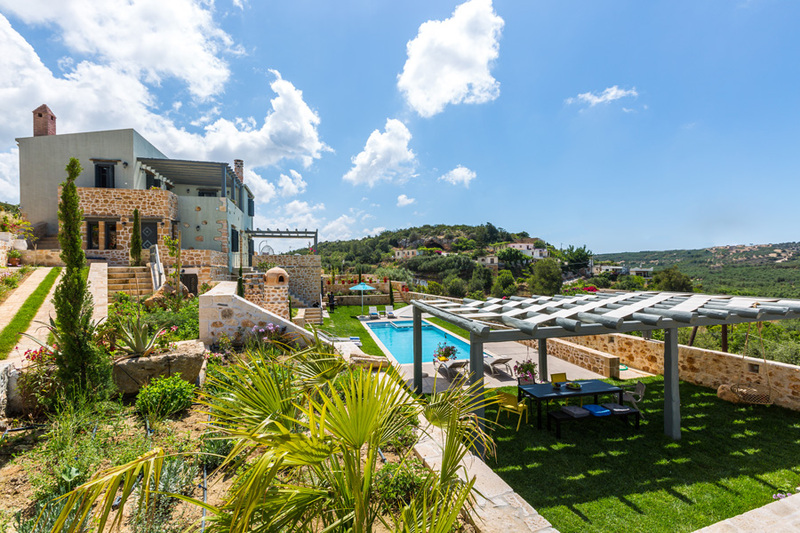 Respecting the environment and our guests, our pool is eco-friendly, using UV lamps for cleaning. 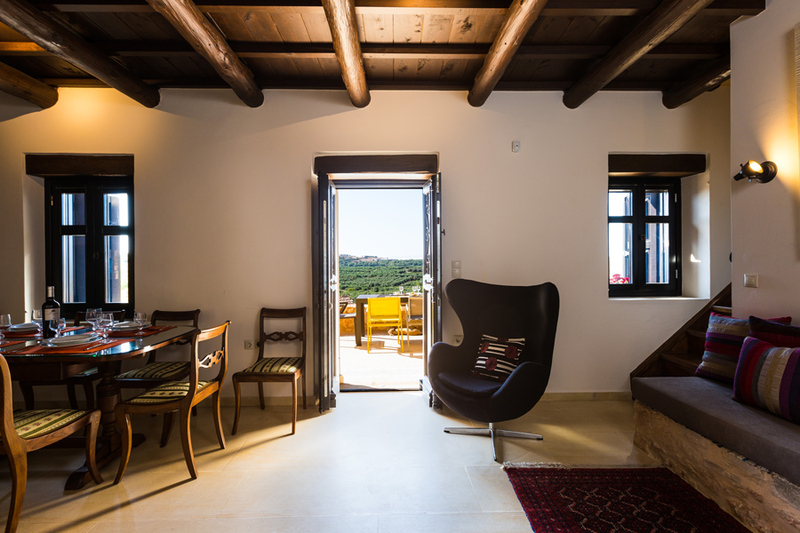 Additionally, right next to the pool level there is garden area dinning table and garden chairs for you to relax! 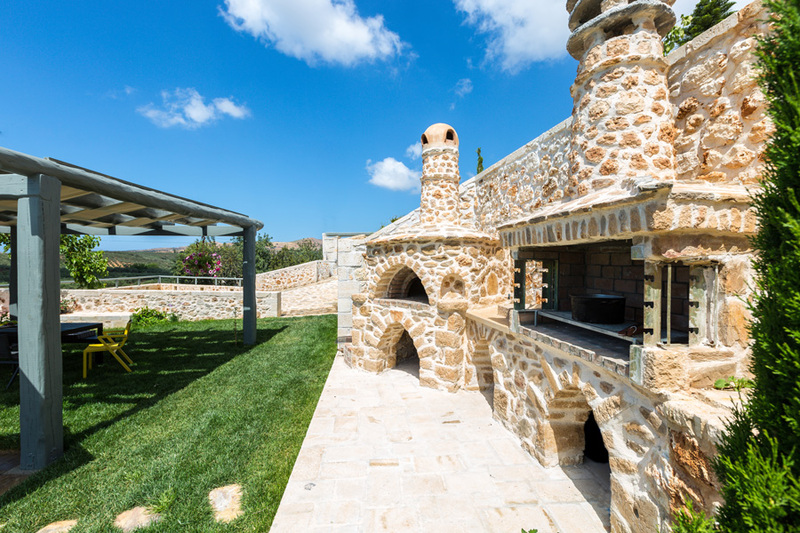 Climbing up the colourfully tiled paved stairs, guests will reach the open plan area of the first floor, boosting a comfortable living room area, with an open fireplace, a 46’ smart TV and a Playstation 4 console, just what you need for a family game. 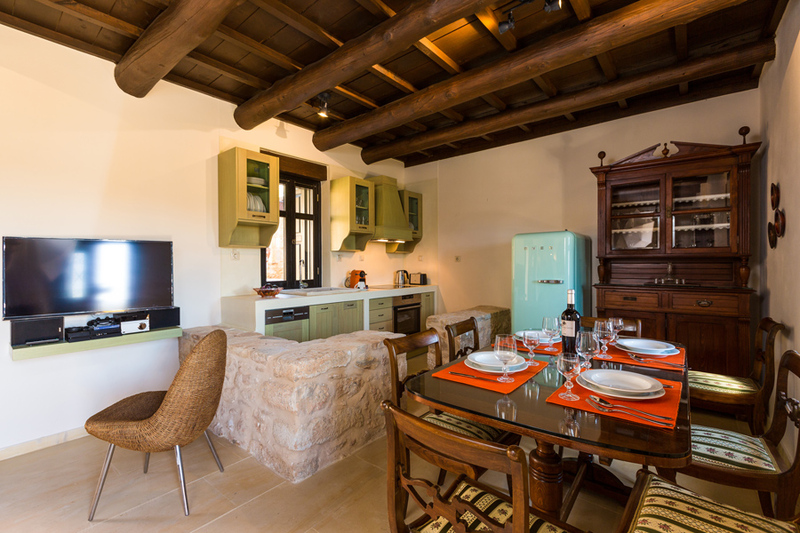 Furthermore, the fully equipped kitchen provided everything you may need for your self-catered stay. 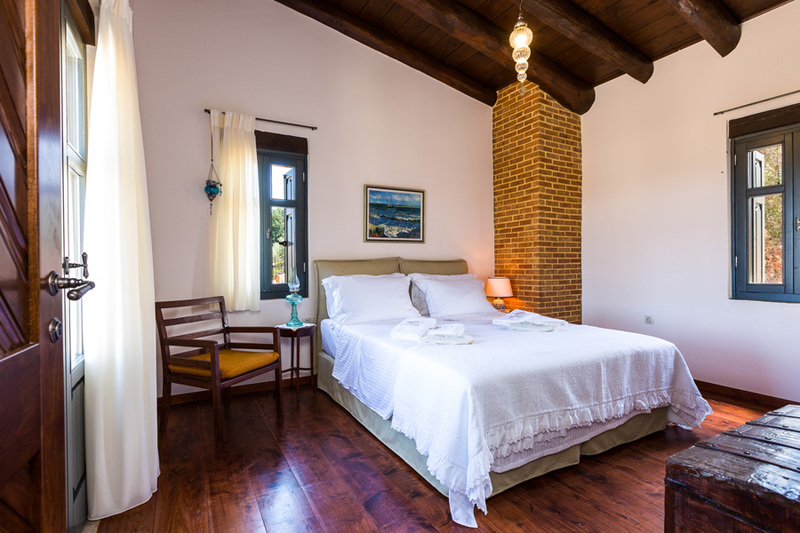 The remaining two bedrooms of Erondas Villa I can be found on the top floor, one of which features a super king size bed (1.70 x 2.20) and the other one two single beds (1.00 x 2.10). There’s four bathrooms, furthermore there is a family bathroom with a hydromassage shower column. 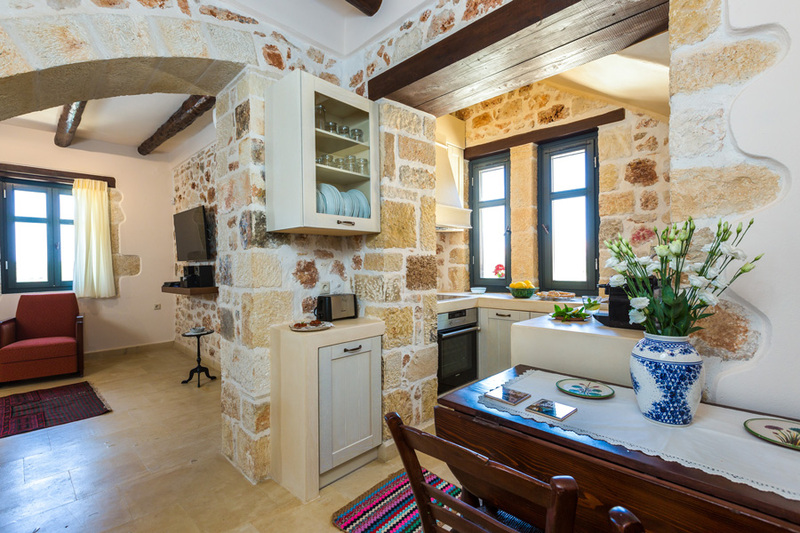 On the ground floor of Erondas Villa I lies a 45 m2 studio, featuring a double bed (1.60 x 2.10), lovely sitting area with stone built benches and an open fireplace, a small but fully equipped kitchenette, TV, as well as an en-suite bathroom with a hydromassage shower column. In this level there is also a working area, with a wooden office, a laptop and printer. 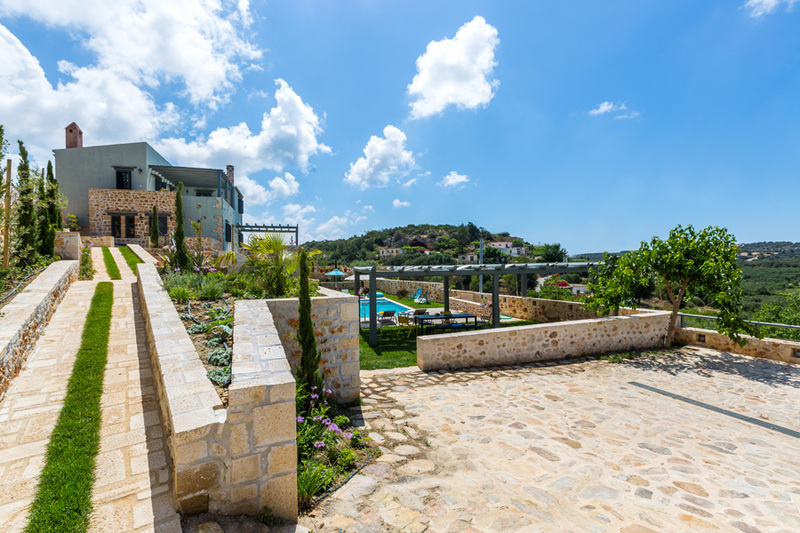 Climbing up the colourfully tiled paved stairs, guests will reach the open plan area of the first floor, boosting a comfortable living room area, with an open fireplace, a 46’ smart TV and a Playstation 4 console, just what you need for a family game. 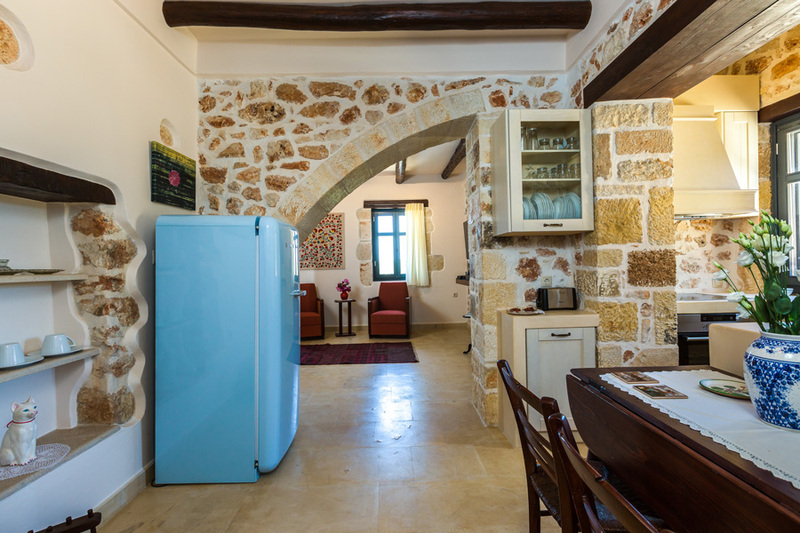 Furthermore, the fully equipped kitchen provided everything you may need for your self-catered stay. 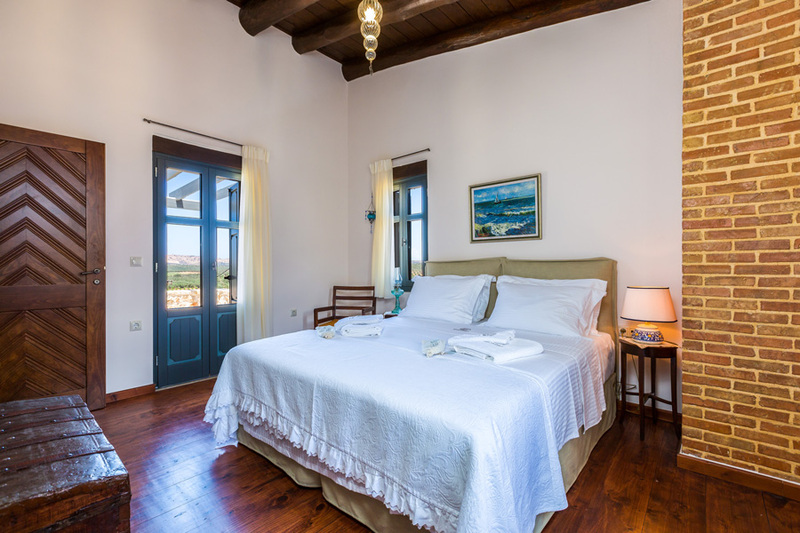 In addition, one more bedroom is located on this floor, providing two single beds (1.00 x 2.10) which could also be used as a super king size bed (2.00 x 2.10). Finally, there’s one family bathroom with a hydromassage shower column. 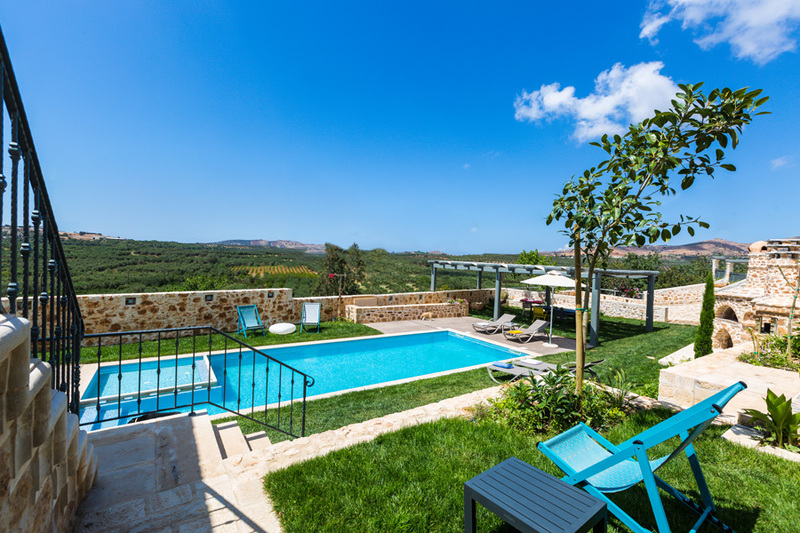 Additionally, this level of Erondas Villa I is suitable for people with special needs and it’s wheelchair accessible (maximum width 60 cm) as it features special ramps, offering direct access to the pool terrace. 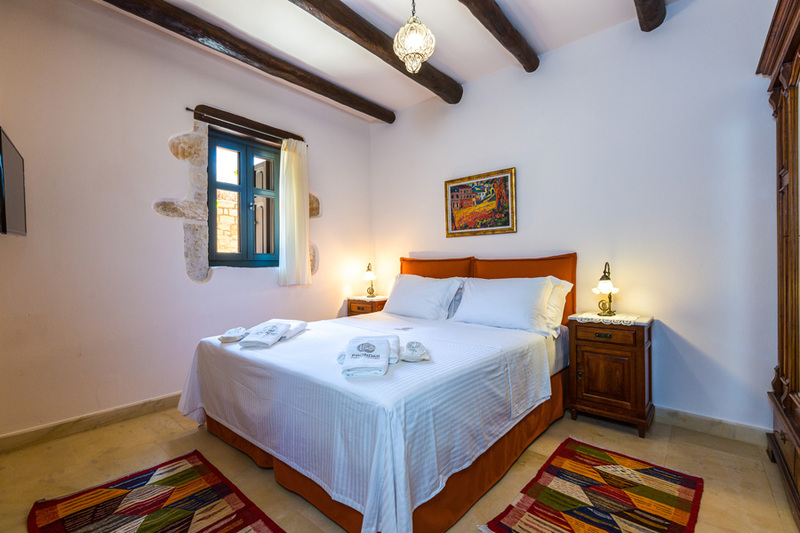 The remaining two bedrooms of Erondas Villa I can be found on the top floor, one of which features a super king size bed (1.70 x 2.20) and the other one two single beds (1.00 x 2.10). Last but not least, there’s one more kitchenette and a shared bathroom with a hydromassage shower column on this floor. 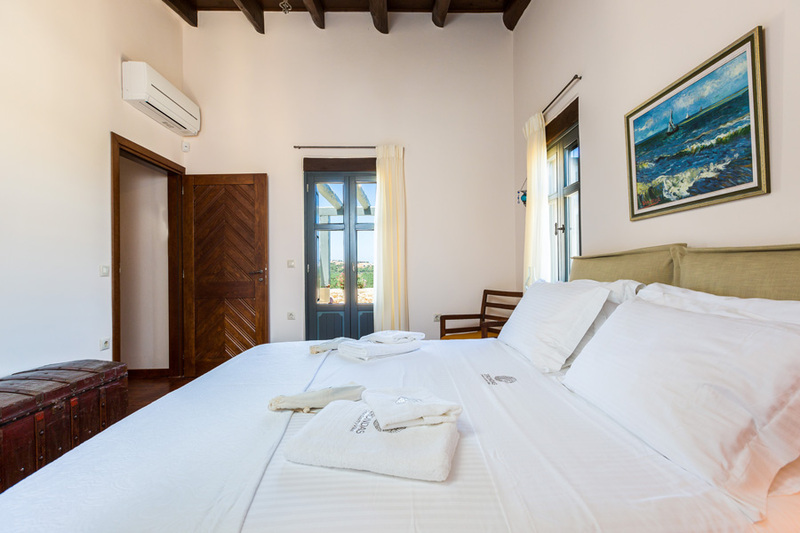 All bedrooms are air conditioned and all beds are beautifully dressed with top quality Coco Mat mattresses, linens and covers, promising a blissful uninterrupted sleep, as well as your outmost comfort. 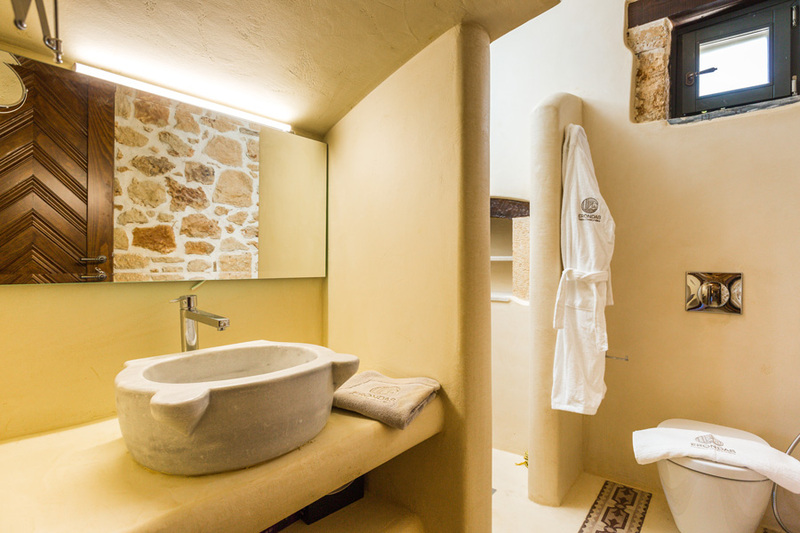 Also, quality bath and pool towels, bathrobes and slippers are provided, along with high quality natural Korres bathroom amenities. 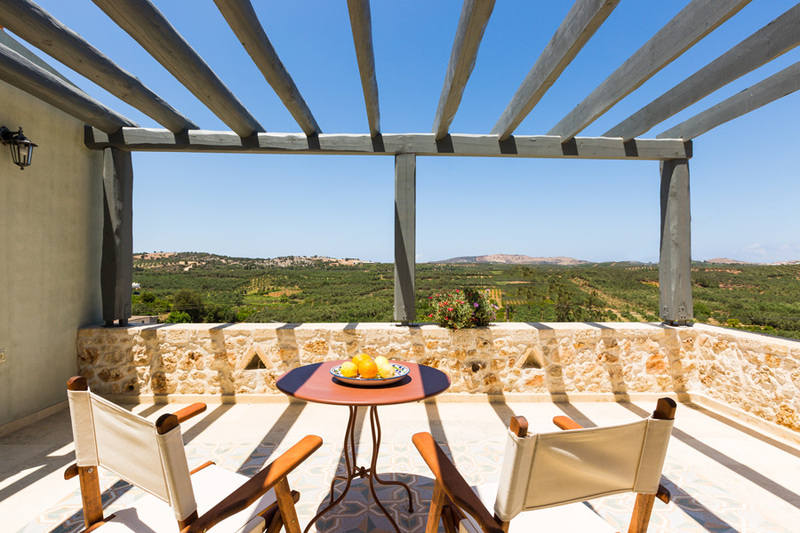 Welcome to Erondas Villas, built on the hillside of the picturesque village of Achlades, offering magnificent views of the surrounding olive groves, along with the so coveted peace and quiet everybody needs while on holiday. 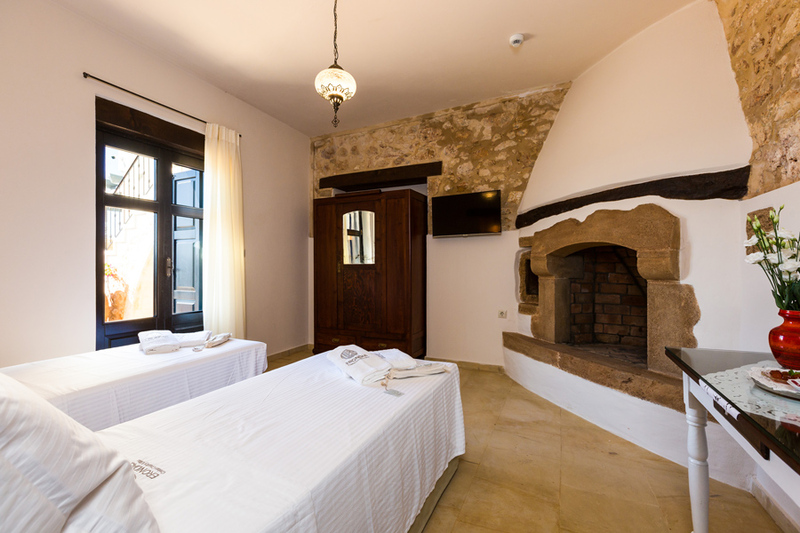 Erondas is an alternative designation for the therapeutical herb, dittany, but in the cretan dialect also means love. 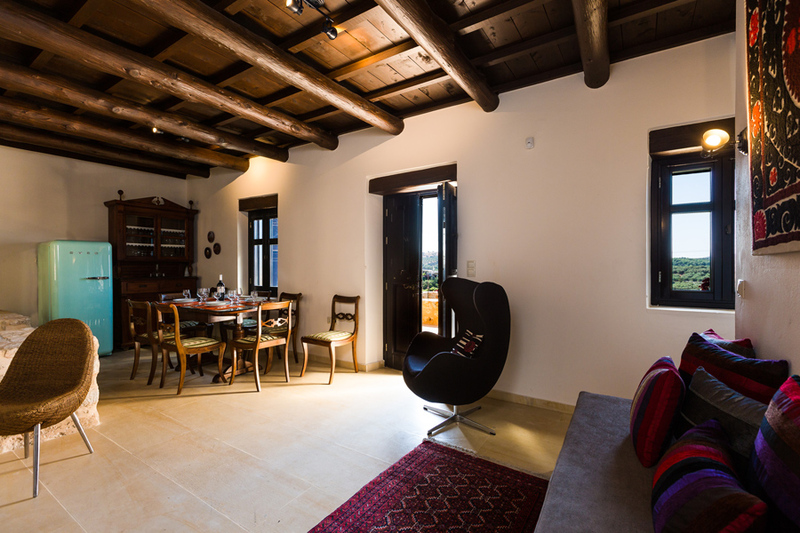 Erondas Villa II covers 190m2 in its 2 levels and can accommodate up to 8 (+2) guests in its 4 bedrooms. 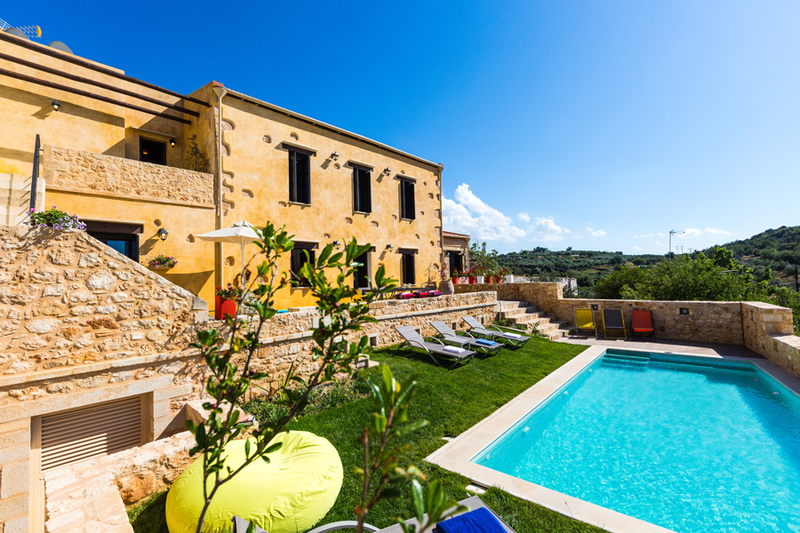 Two more guests could be accommodated in folding beds, making this villa big enough for large families or groups of friends. 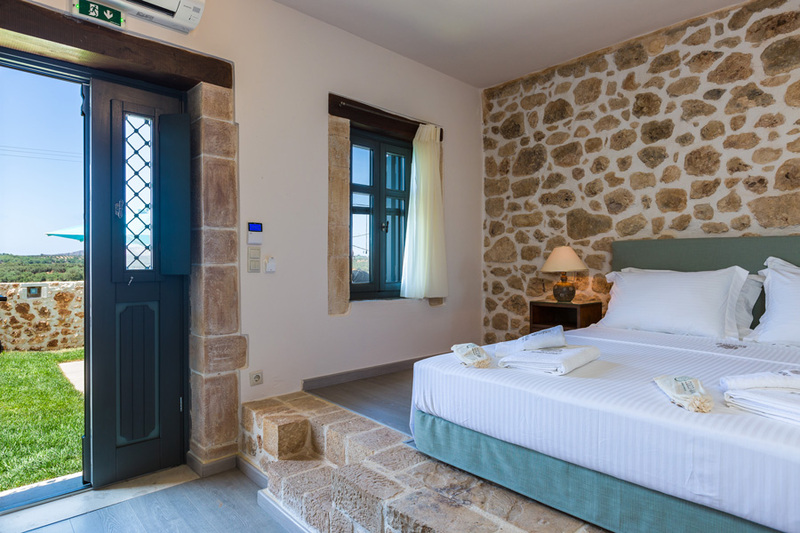 The villa is actually a traditional residence of the mid 19th century, in complete harmony with the environment, thanks to the careful restoration which recently took place and gracefully turned it in a luxurious, fully equipped villa, unique for long breaks in the beautiful island of Crete. 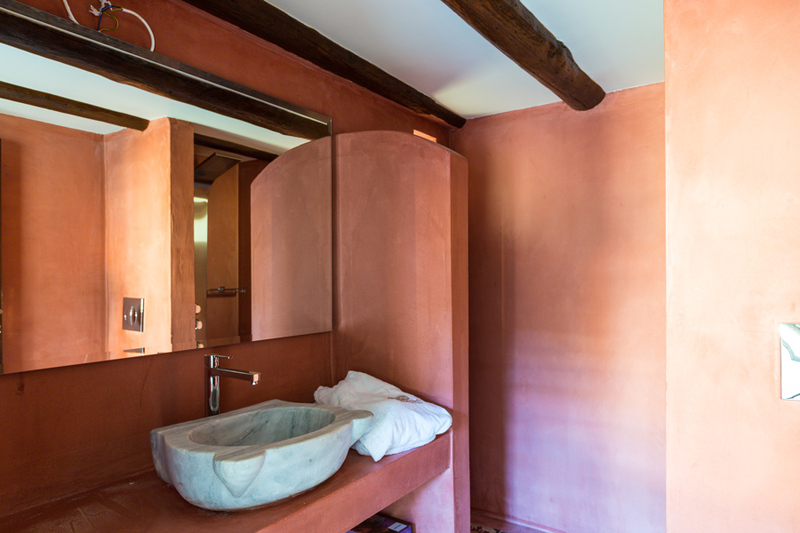 The local materials that were used for the remodelling of Erondas Villa II, include untreated stones, tiles of the interwar era, cypress trunks and handmade bricks and an old trough, adhering to the traditional architecture and respecting the residence’s history. 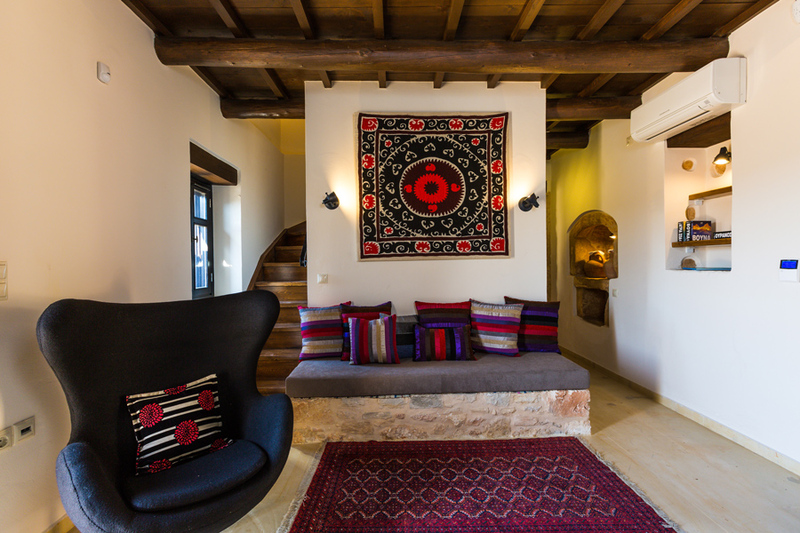 The traditional elements and its authentic character were preserved and highlighted throughout the villa: some exquisite pieces of furniture carefully restored, wall arches, wooden floors and ceilings, creating unique ambient spaces of high aesthetics. 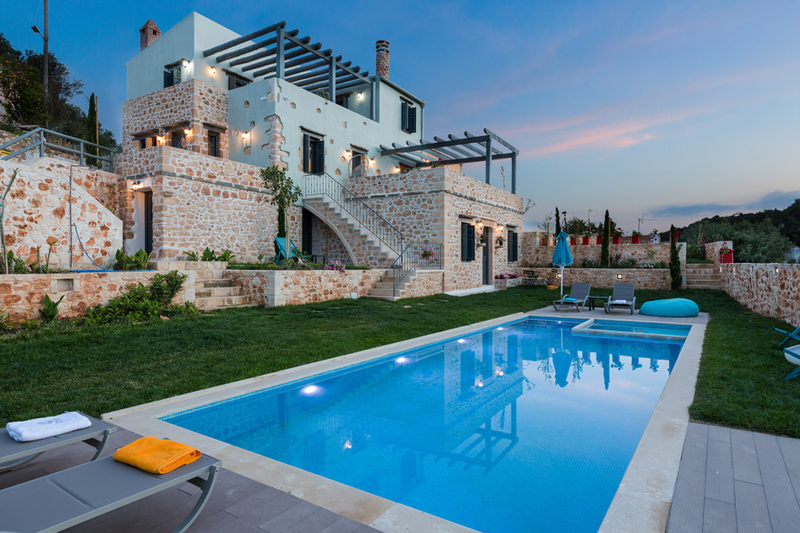 Villa II is approved by Greek Tourism Organization with license number 1041K91003162101 & 1041K91003193801. 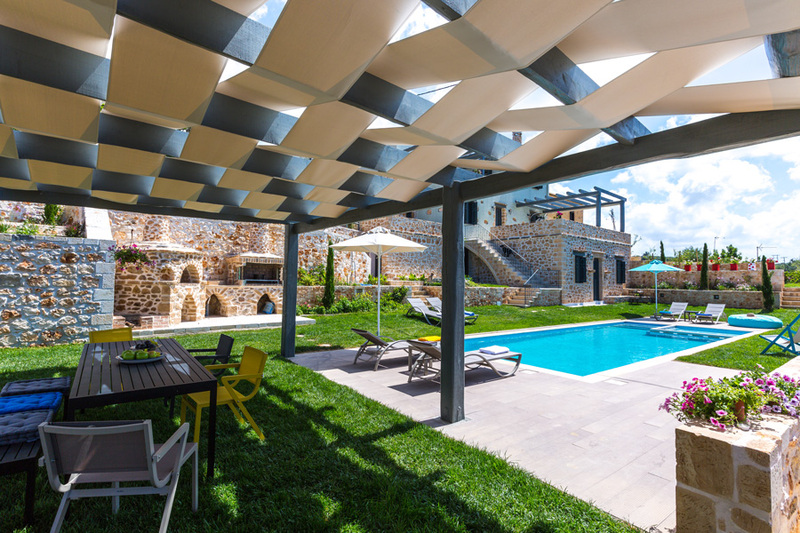 The 150 m2 pool terrace is lawn covered, filled with flowers and equipped with sun beds and umbrellas, so you can stay there all day long! 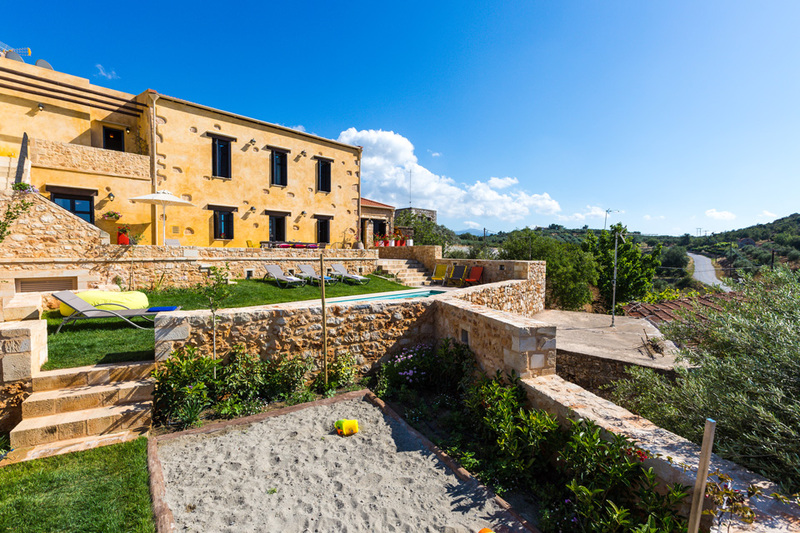 Additionally, right below the pool level there is playground area with toys and soft sand, perfect for the kids to play. On the first floor boosting a cosy living room area, with a 42’ smart TV and a Playstation 4 console, just what you need for a family game. 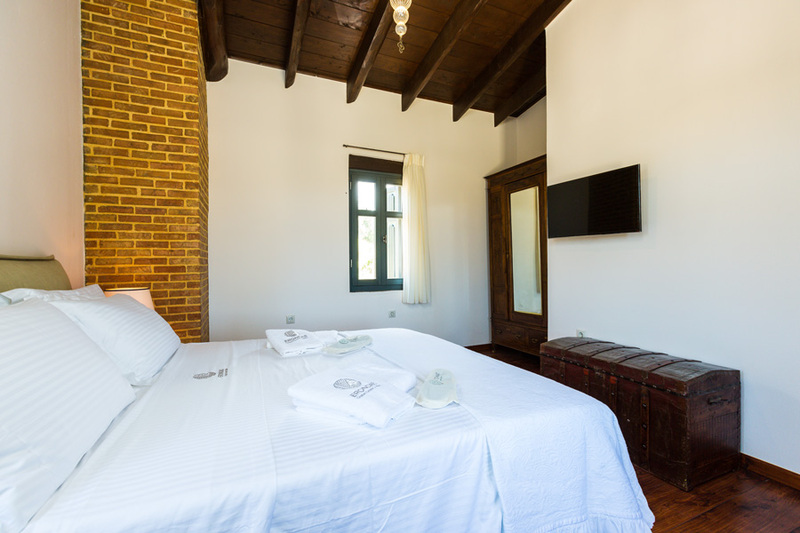 On the ground floor of Erondas Villa II lies an open plan area of the first floor, the fully equipped kitchen provided everything you may need for your self-catered stay. 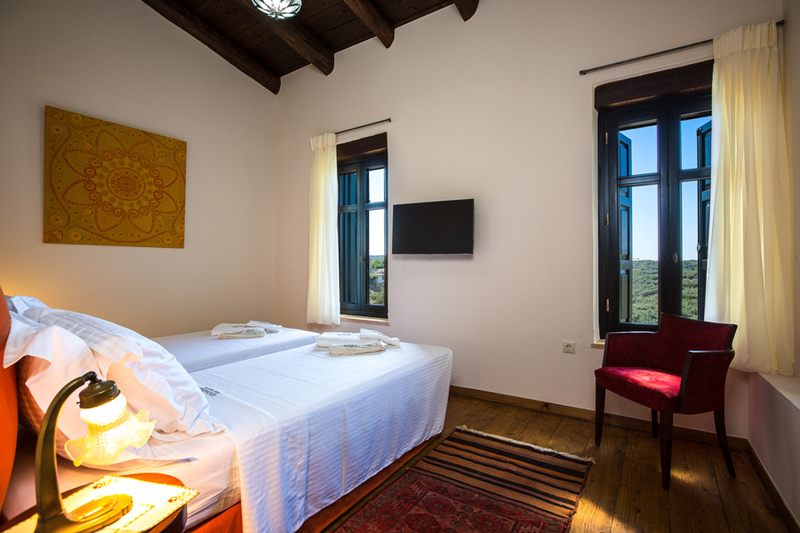 All bedrooms are air conditioned and all beds are beautifully dressed with top quality Coco-Mat mattresses, linens and covers, promising a blissful uninterrupted sleep, as well as your outmost comfort. 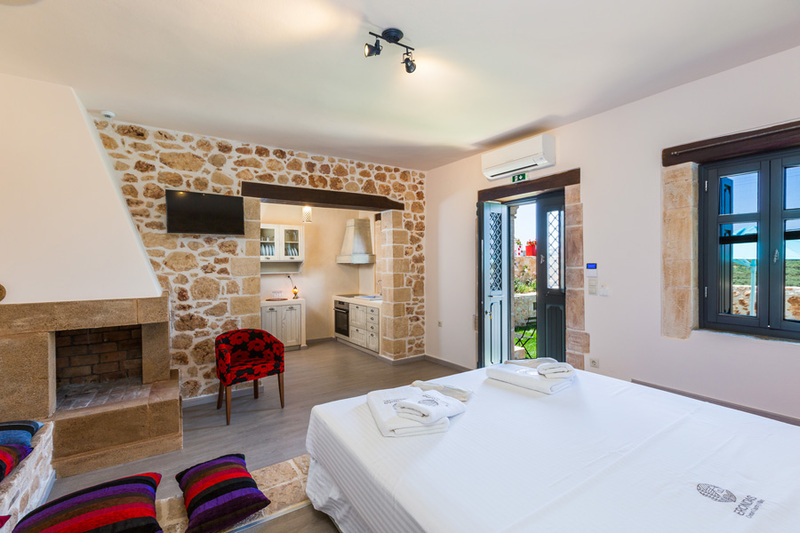 All bathrooms have hydromassage columns and quality bath and pool towels, bathrobes and slippers are provided, along with high quality natural Korres bathroom amenities. 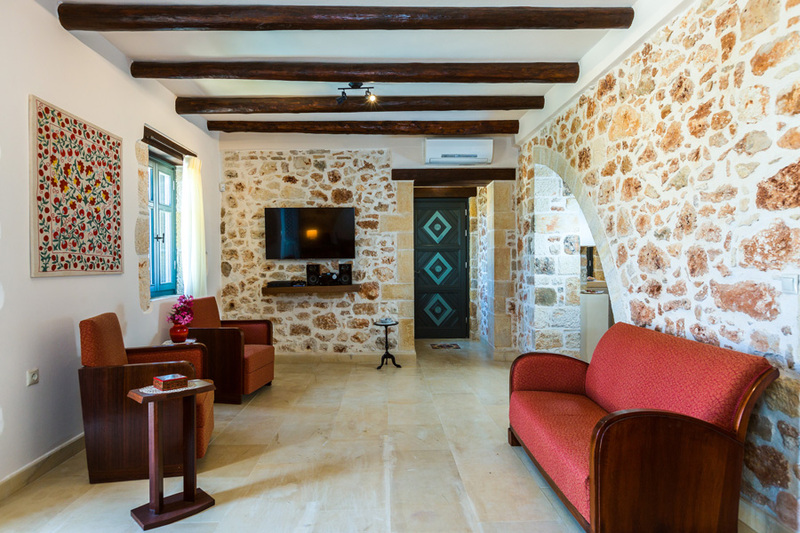 On the ground floor of Erondas Villa II lies an open plan area of the first floor, boosting a cosy living room area, with a 42’ smart TV and a Playstation 4 console, just what you need for a family game. 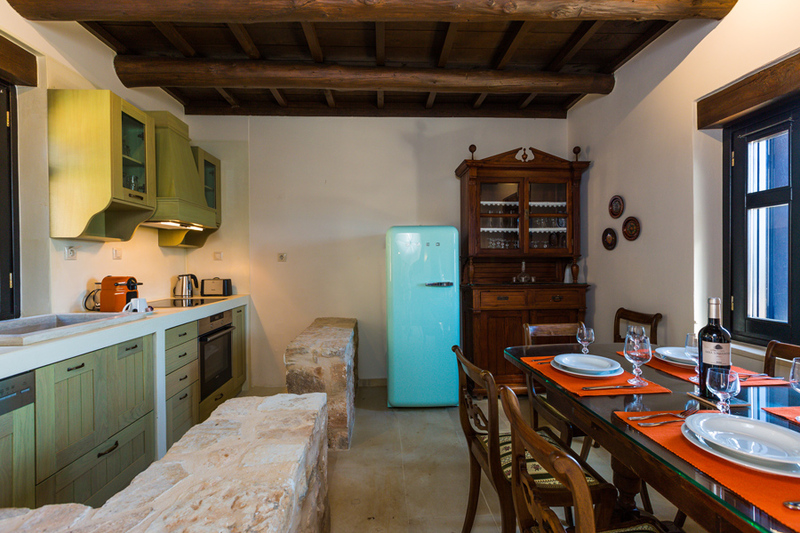 Furthermore, the fully equipped kitchen provided everything you may need for your self-catered stay. 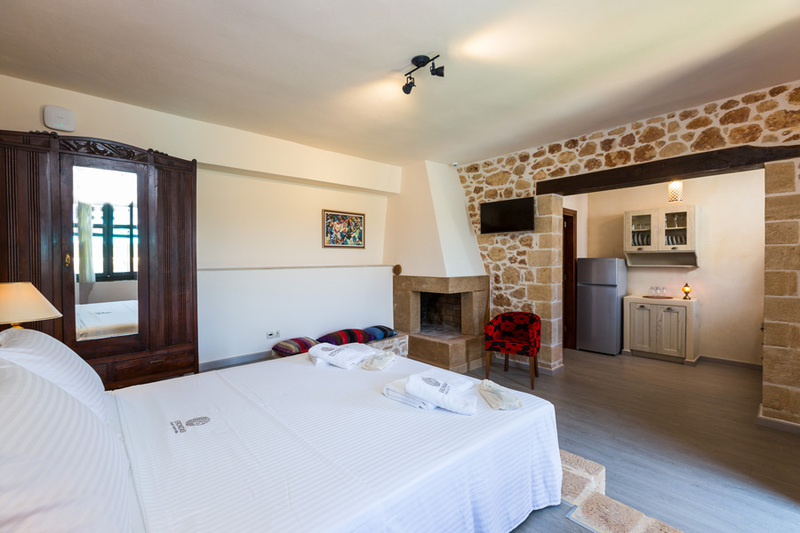 Also, a 45 m2 suite, featuring a wonderful loft-type bedroom with a double bed (1.60 x 2.10), lovely sitting area with stone built benches and direct access to the veranda, a small but well equipped kitchenette, TV, as well as an en-suite bathroom is located on this floor. 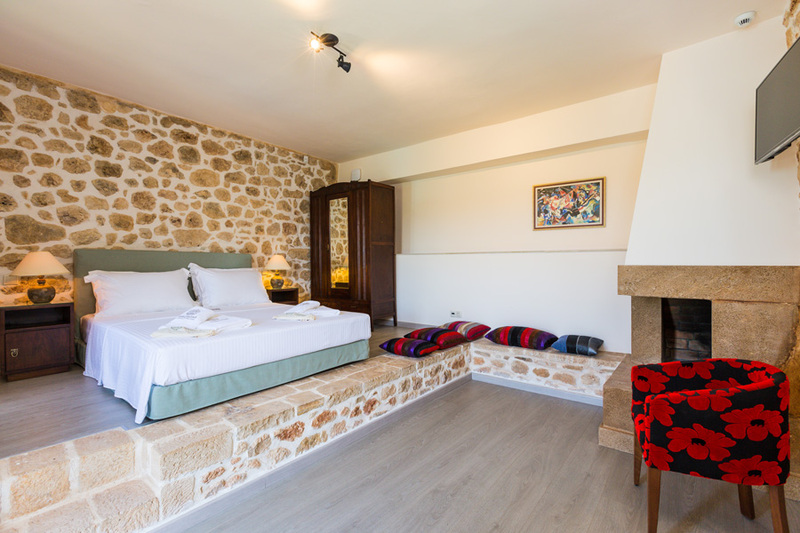 In addition, one more bedroom providing two single beds and an open fireplace, can be found on this level, as well as a family bathroom with a hydromassage shower column. 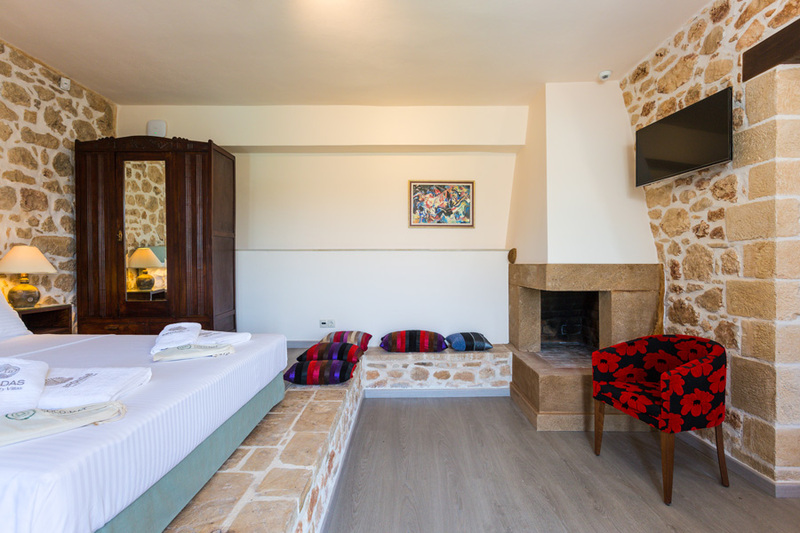 Climbing up the colourfully tiled paved stairs, guests will reach the remaining two bedrooms of Erondas Villa II, one of which features a king size bed and the other one two single beds. 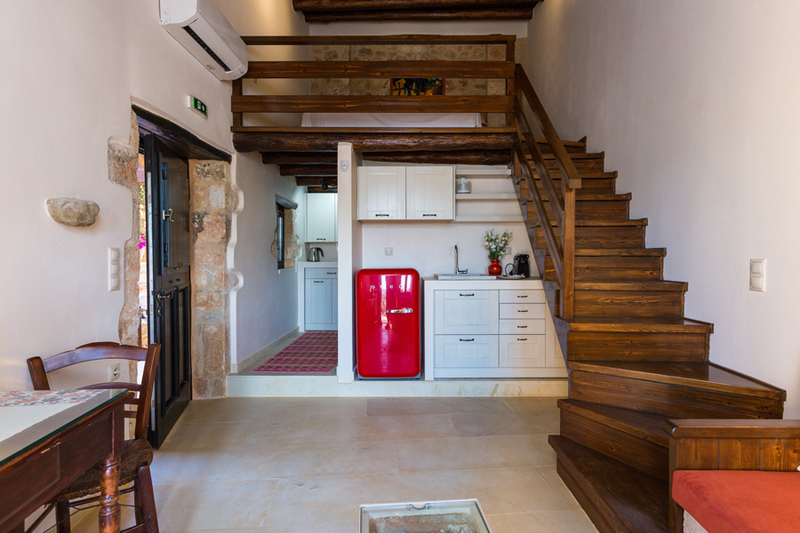 Last but not least, there’s one more kitchenette and a shared bathroom on this floor. 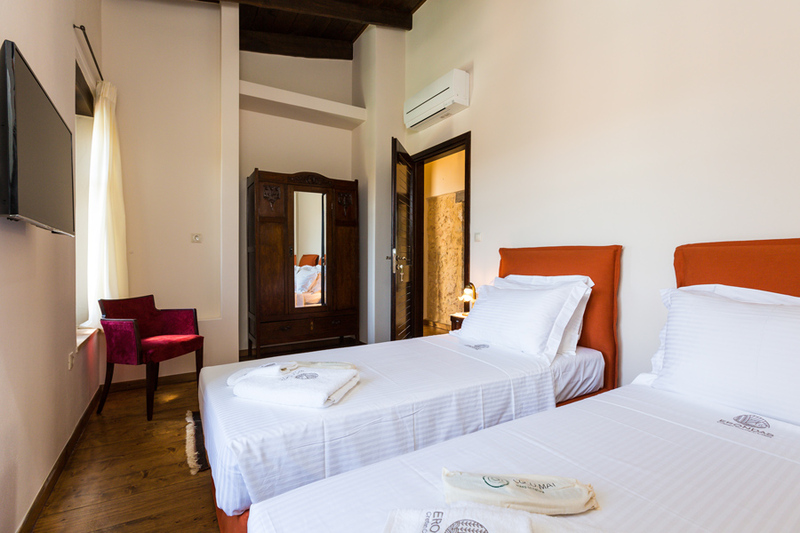 All bedrooms are air conditioned and all beds are beautifully dressed with top quality Coco-Mat mattresses, linens and covers, promising a blissful uninterrupted sleep, as well as your outmost comfort. 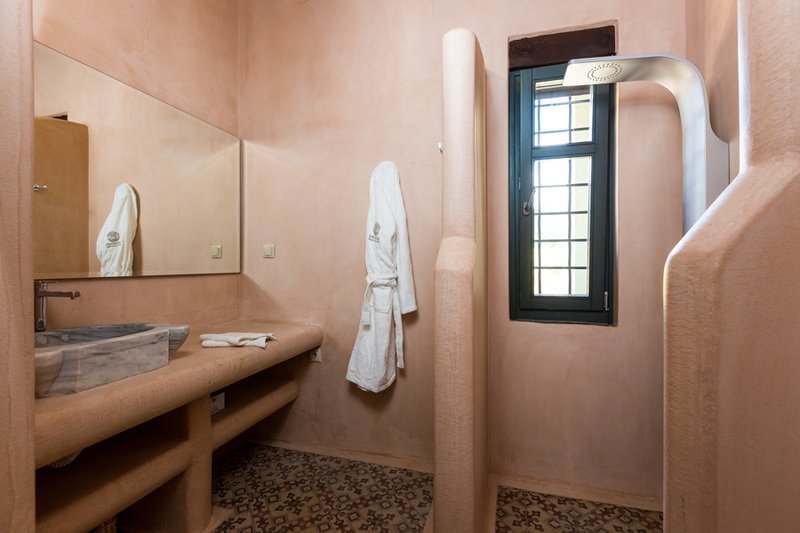 All bathrooms have hydromassage columns and quality bath and pool towels, bathrobes and slippers are provided, along with high quality natural Korres bathroom amenities. 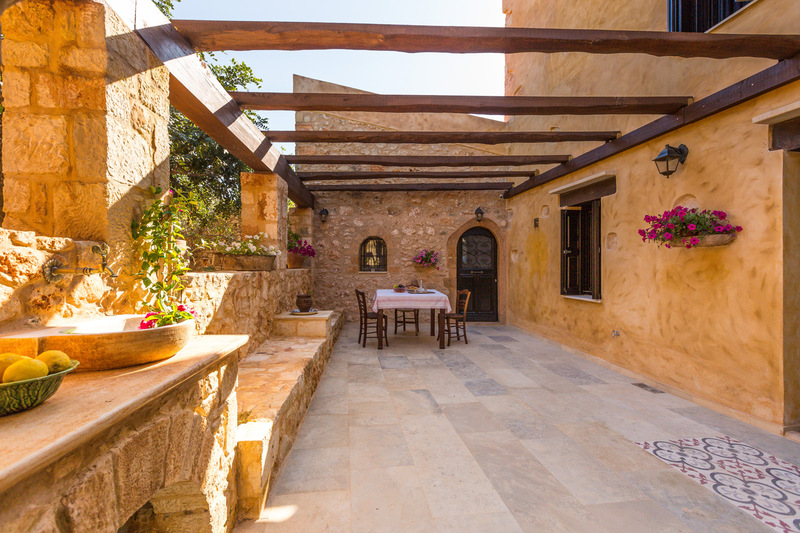 As you enter Erondas Villa II you will find yourselves in a romantic courtyard, where the stone built BBQ facilities are at your disposal to prepare your meals and try al fresco dining under shaded pergola. 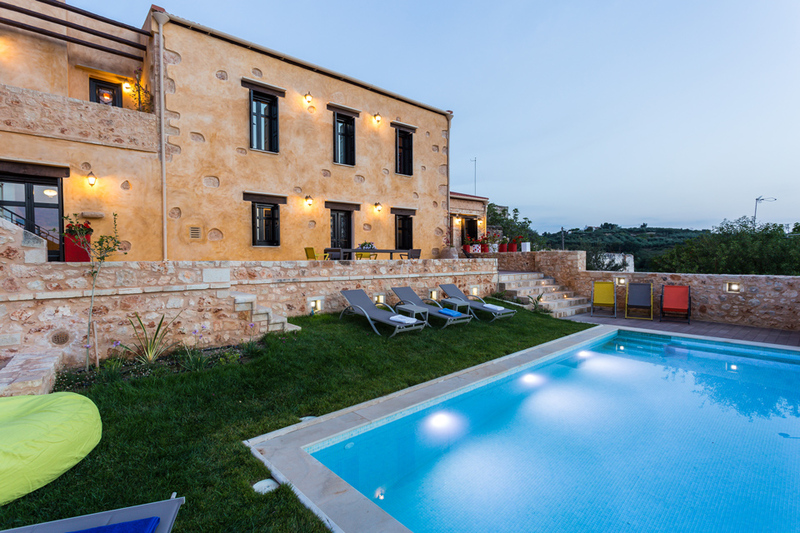 At the rear part of the villa the pool area of the villa awaits to welcome you, a dreamy place, offering full privacy, which you will never want to leave! 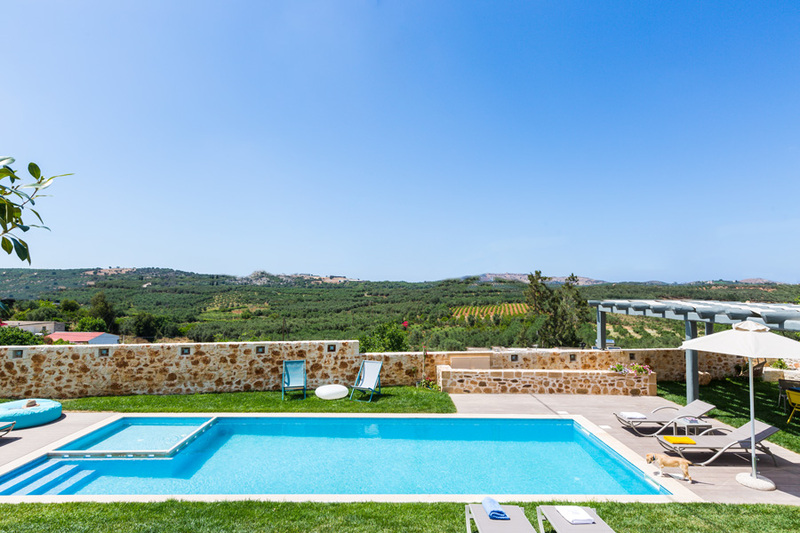 Unwind by the 40 m2 private pool (0,90 cm to 1,50 m deep) and enjoy the hot summer sun! Respecting the environment and our guests, our pool is eco-friendly, using UV lamps for cleaning. 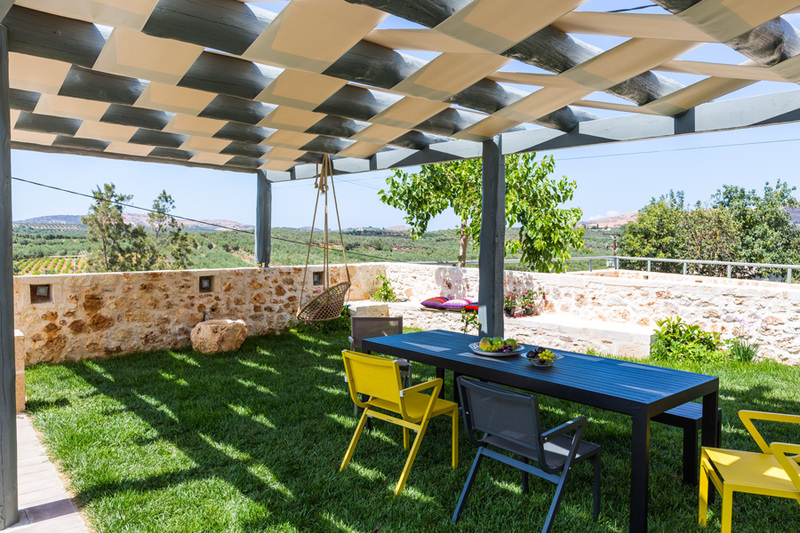 To make things even better, the verandas of Erondas Villa II, equipped with patio furniture, occupy 110 m2 where you could have your breakfast or your night’s drink and let the cool summer breeze take all your worries away! After the Venetian conquest of Crete (1204), the town of Rethymnon was built according to the rules of Venetian architecture. 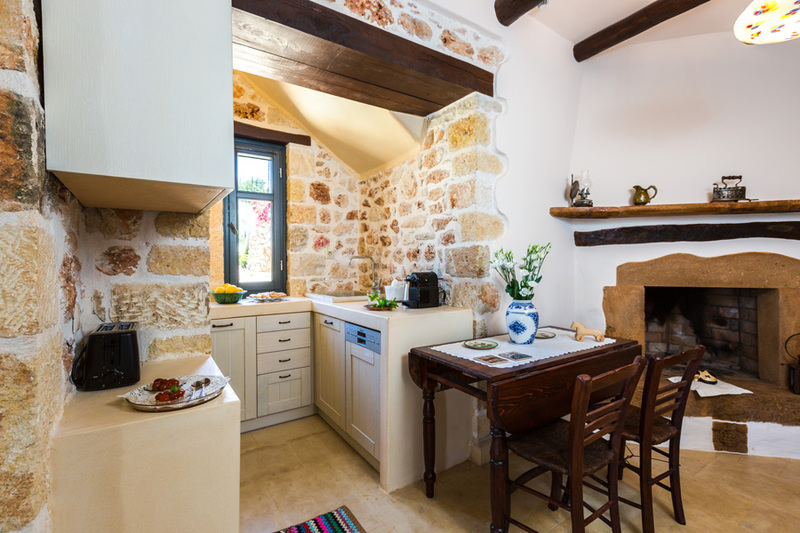 The original craftsmen were Venetians, but these later were replaced by Cretan murari, Venetian-trained master builders. 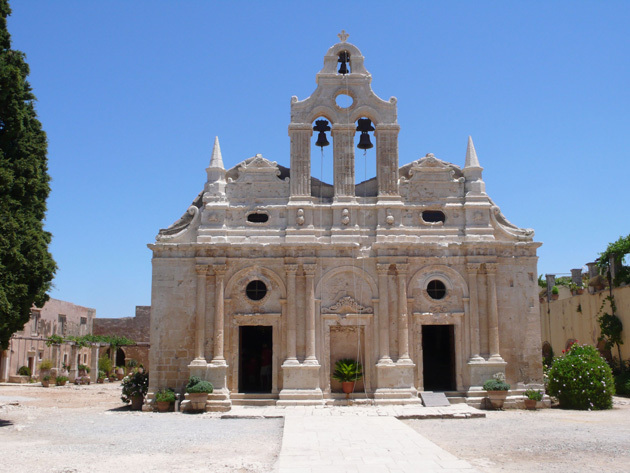 The Monastery of Arkadi is a historic monastery in Crete. 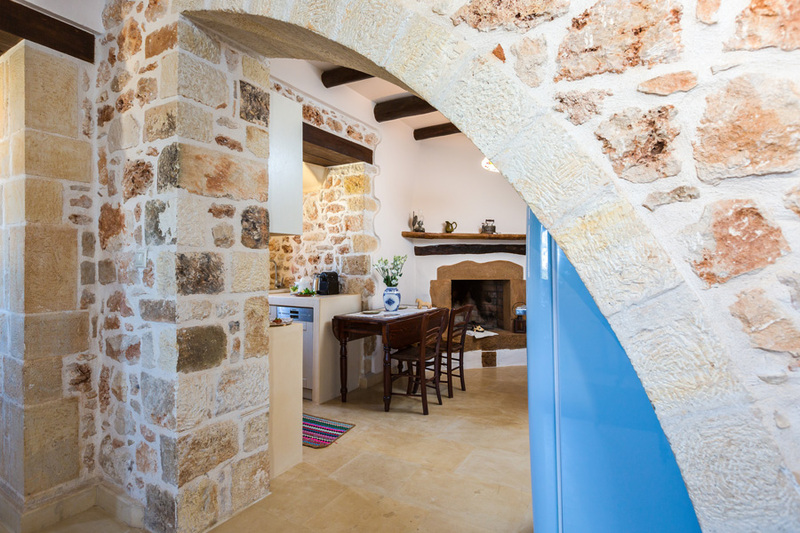 According to tradition it was founded by Emperor Heraklion and rebuilt around the 5th century by the Byzantine Emperor Arcadius, whose name bears his honor. 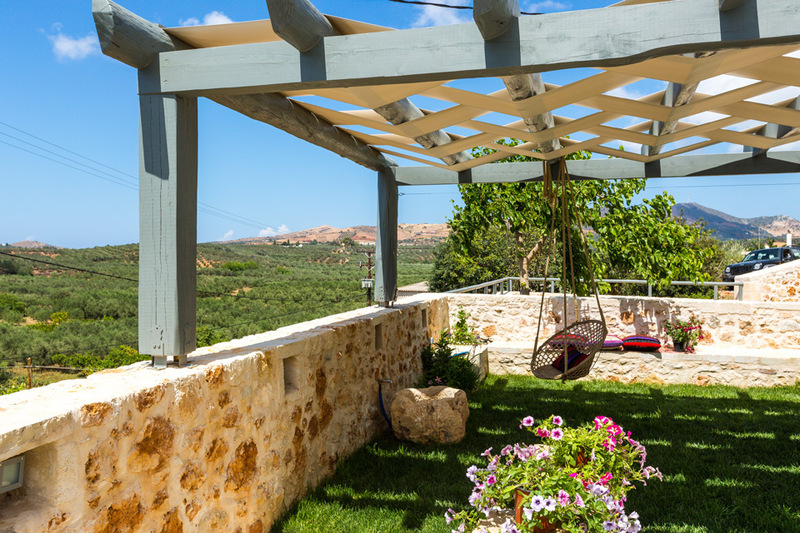 Others said it was founded by a monk who is named Arcadius and therefore monastery is calles Arkadi.Remains of the first monastery have been preserved in the northwestern part of the enclosure. The most important part of Arkadi Monastery is the central two-aisled church , the Catholicon , which is dedicated to the Transfiguration of the Savior (one aisle) , and the Saints Constantine and Helen (the other aisle), surrounded by very thick yard walls in which there various auxiliary buildings . 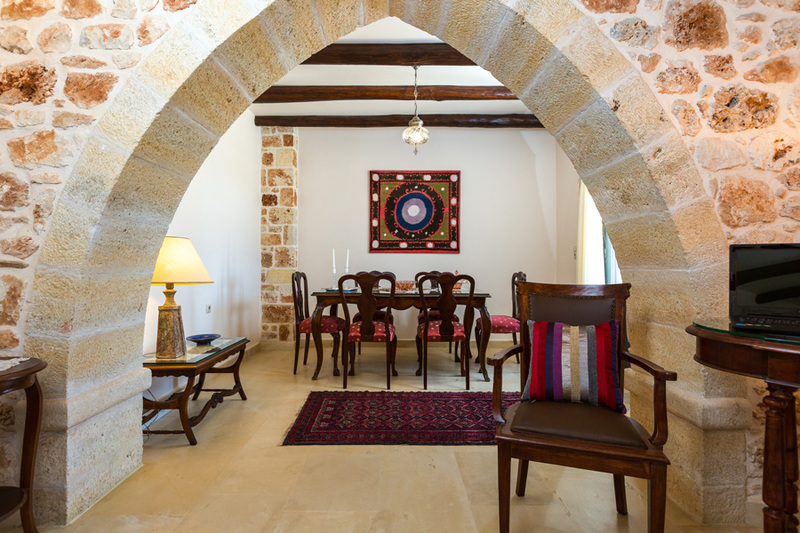 The Turkish yoke in Crete count already two hundred and fifty years when - after ongoing uprisings - Cretan rebels began to gather in Arkadi from March 3, 1866 . The attack began on 8 November 1866. In the monastery there were 964 souls , 325 men and the rest women and children. 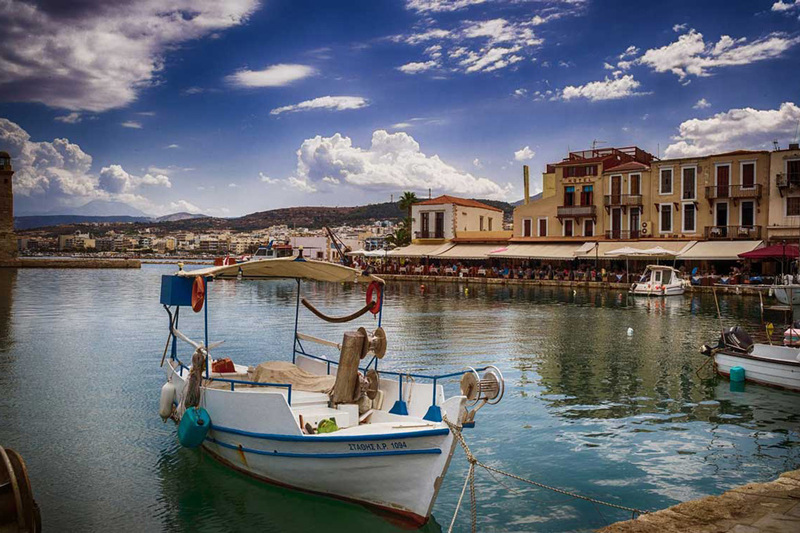 PanormoA cosmopolitan seaside village with neoclassical buildings and the air of nobility. Panormo is situated about 6km from Achlades. There are actually two main beaches and a few smaller ones. 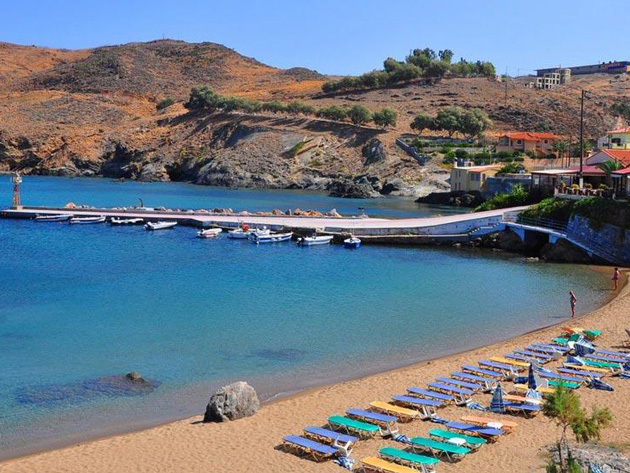 The harbor (Limanaki) beach in front of the village is the port of the area. It is ideal for children, as it is shallow and well protected from winds with piers, where the boats tie up. It is organized with umbrellas, showers, water sports and accommodation facilities around. Bali is situated about 8km from Achlades. 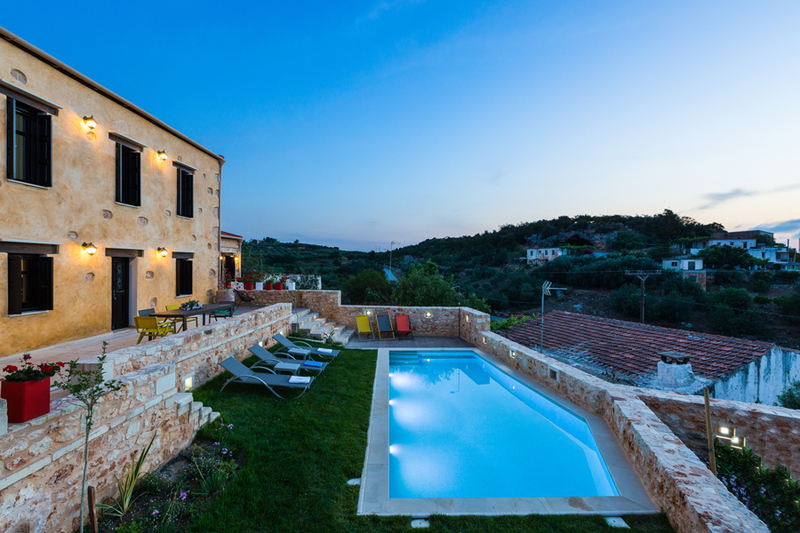 In the past, during the Venetian occupation the village was called Atali, coming from its old greek name Astali. 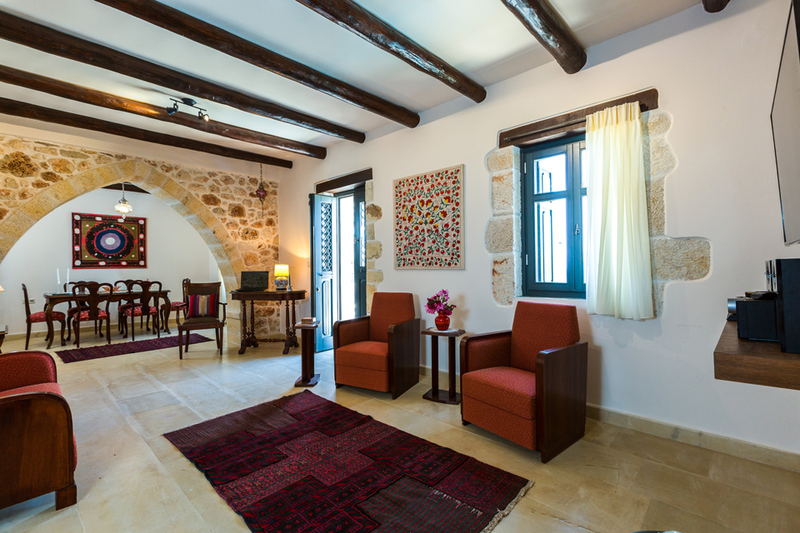 You can find a monastery nearby which is named Atali. There are four beautiful, organized beaches which are protected from the strong north summer winds by the small gufls. The names of the beaches is Livadi, which is the biggest and it has sandy beach, the next one is Varkotopos which has.sandy beach, too. After, there are the Limani beach which is the port of Bali and the Karavostasi beach which is hidden behind of the hill with pebbled beach and smalls bays. Also you can find many taverns, cocktail-bars and shops.